I've seen some of the the trailers that look like the rear end of a Solstice. Have these all been one off's custom made by owners? Is there a shop that made them? Is there a market for them if someone was to make one? What would they sell for if there was one for sale? The few that I've seen appear to be made from a wrecked car . I have to believe that the market would be limited especially because of the fact that there are companies out there who make a small trailer that fits on a number of cars and is not brand specific . I am in the beginning stages of cutting a Sky in half to make a trailer out of it. If you look thru the National photos you will see one done in Bluestone. Mine will be similar, but no cooler or spare tire in the front. Spare will go underneath. Aluminum frame with torsion axles and electric brakes. Every once in awhile you can see a fiberglass trailer that has Solstice or Sky tail lights in it, but just a tub. No real lines. I have never seen one that looked right behind a Solstice or Sky. After the National last year I decided that, that was the way to do it. Hope to have it done by summer. Will post pictures once we get seriously started. I bought a totaled Sky to do this, it could have been saved, but it was an NA and I did not figure I could ever break even on the car by fixing it. I ended up buying two NA Bluestone Sky's to make the trailer. One hit in the front, one hit in the rear. The one hit in the front has a bad engine in it. The other one the engine seems fine, runs great so pulled it and have it ready to go in the other one. Have considered not doing the trailer and making a track car out of the other one. But I just loved the look of the trailer. Yesterday I got a free trailer hitch, so decided it was meant to be. I almost bought one of the tubs with Sky tail lights last winter, but it was in Des Moines, and sold in January. Had to be picked up by the end of January, decided I was not driving that far to pick up something I thought was that ugly.. Then went to the National, and was so glad I did not buy it. It was about 1500.00 if I remember correctly. Will be lucky to get this one done for under 7K. Oh well you want what you want, or you don't get it. Everything is in line to build it. Just getting the time to do it is where I am at. I have built custom trailers my whole life, so I am always looking at them. If I see one of the tub things I will post it here. Last edited by skersfan; 03-10-2019 at 06:49 PM. Ebay, under fiberglass motorcycle trailer. It won't let me post a link for some reason. The thing weighs 900 pounds. Pretty good sized, but would not look bad behind a Sol or Sky. This is pretty good looking, but it is located in Oregon. Last edited by skersfan; 03-10-2019 at 07:37 PM. Well the last one is gone. I just bought it. Just too resonable to not buy and save myself a lot of work. Just want to use it for travel and will have it painted to match the Skpel. Darn you Saveaux!!!! Now I have to drive to Oregon or have it shipped. Will figure that out soon. The track car is now a possiblity. It will be an Arizona car so not concerned about smog stuff. V8 with paddle shifters looks to be in my future. skersfan, that's a good looking trailer and you got a good one at a very good price. Mine is a topper for a station wagon mounted on a small trailer on an aluminum sheet (photo below). Pulls like there is nothing back there. Much harder to pack than Bob's purchase and his is larger than mine. At that price it is well worth the money. I have about $800 in mine. Ours does go in the garage along with the car and other stuff, so that part is worth it for us. I've talked to motorcycle guys pulling trailers that said they had $5K in their trailer. Another perspective is with the frequency of use of a trailer (5 out-of-town trips in 7 years), it is smart to keep the car for parts and you will get the trailer for nothing plus some. Granted the rear-end SKY trailer is a very big spectacle. sirwm and easyryderca like this. I was going to call you, but forgot about daylight savings time. I will try to give you a call tomorrow. I have work in the morning, but should be home early afternoon. Just too much work to be used as little as it would be. This will fit in the garage, that becomes something to think about. It will even fit in the storage facility I think. I liked the look of it and just decided to save money and get it. I made the deposit and should hear from them soon. I may have it shipped down. Not sure. Notified this morning, that he had recieved an earlier deposit. So most likely will not get the trailer. I thought it was pretty good looking. Will wait a few days and see if the other person buys it. If not I told him I would take it. If not back to the old plan. No big deal. Sorry for the false alarm. Two years ago, I was in to buying a 'tub' with sol tail lights, but finally didn't. 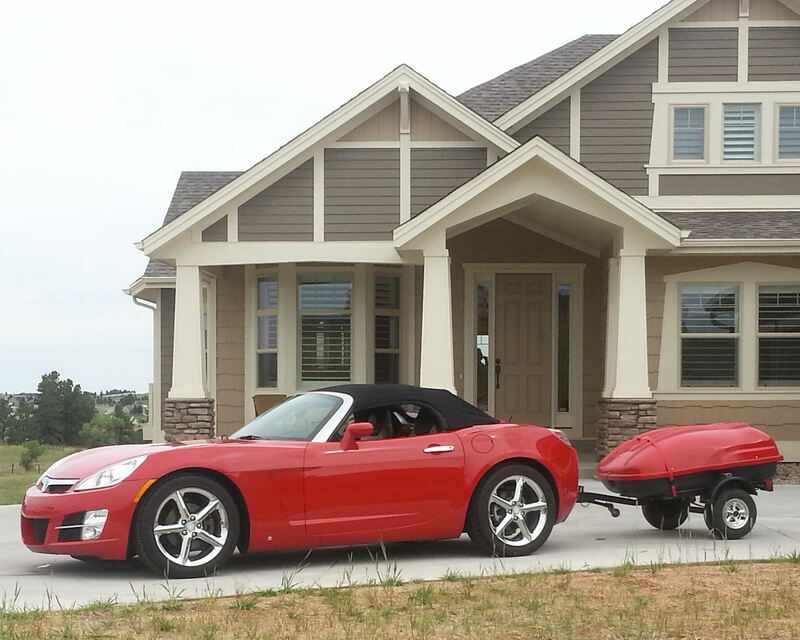 Bought me a Bushtec motorcycle trailer instead and to me, it fits the best the looks of the Solstice. Butas Rob said : "beauty is in the eye...."
solman06, rob the elder, easyryderca and 1 others like this. Hows about a mini Kappa trailer. rob the elder and easyryderca like this.